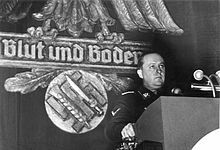 Richard Walther Darré, born Ricardo Walther Óscar Darré (14 July 1895 – 5 September 1953), was one of the leading Nazi "blood and soil" (German: Blut und Boden) ideologists and served as Reich Minister of Food and Agriculture from 1933 to 1942. He was a high-ranking functionary in the SS and the seventh most senior commander in the organisation. Darré was born in Belgrano, a Buenos Aires neighbourhood, in Argentina to Richard Oscar Darré, a German with Huguenot ancestry (born 10 March 1854, Berlin; died 20 February 1929, Wiesbaden) and Emilia Berta Eleonore, née Lagergren (born 23 July 1872 in Buenos Aires to a Swedish-born father and German-Spanish born mother; died 20 July 1936 in Bad Pyrmont). His father moved to Argentina in 1888 as a partner of the German international import/export wholesaler Engelbert Hardt & Co. Although his parents' marriage was not a happy one (Richard Walther remembered his father as a hard drinker and a womanizer), they lived prosperously, and educated their children privately until they were forced to return to Germany as a result of worsening international relations in the years preceding World War I. Darré gained fluency in four languages: Spanish, German, English, and French. Darré's parents sent him to Germany at age nine to attend school in Heidelberg; in 1911 he attended as an exchange pupil King's College School in Wimbledon. The rest of the family returned to Germany in 1912. Richard (as he was known in the family) then spent two years at the Oberrealschule in Gummersbach, followed in early 1914 by the Kolonialschule for resettlement in the German colonies at Witzenhausen, south of Göttingen, which awakened his interest in farming. After a single term at Witzenhausen, he volunteered for army service. He was lightly wounded a number of times while serving during World War I, but fared better than most of his contemporaries. When the war ended he contemplated returning to Argentina for a life of farming, but the family's weakening financial position during the years of inflation made this impossible. Instead he returned to Witzenhausen to continue his studies. He then obtained unpaid work as a farm assistant in Pomerania: his observation of the treatment of returning German soldiers there influenced his later writings. In 1922 he moved to the University of Halle to continue his studies: here he took an agricultural degree, specialising in animal breeding. He did not complete his PhD studies until 1929, at the comparatively mature age of 34. During these years he spent some time working in East Prussia and Finland. He married twice. In 1922 he married Alma Staadt, a schoolfriend of his sister Ilse. He divorced Alma in 1927, and subsequently married Charlotte Freiin von Vittinghoff-Schell, who survived him. The first marriage produced two daughters. As a young man in Germany, Darré initially joined the Artaman League, a Völkisch youth-group committed to the back-to-the-land movement. In this context he began to develop the idea of the linkage between the future of the Nordic race and the soil: the tendency which became known as "Blut und Boden". Here "Blut" (blood) represents race or ancestry, while "Boden" expresses the concepts of soil, territory, or land. The essence of the theory involved the mutual and long-term relationship between a people and the land that it occupies and cultivates. Darré's first political article (1926) discussed Internal Colonisation and argued against Germany attempting to regain the lost colonies in Africa. Most of his writing at this time, however, concentrated on technical aspects of animal breeding. He wrote his first book, Das Bauerntum als Lebensquell der nordischen Rasse ('Peasantry as the life-source of the Nordic Race'), in 1928. It asserted that German farms had previously been bestowed on one son, the strongest, ensuring the best were farmers, but partible inheritance had destroyed that. Darré demanded the restoration of the ancient tradition, as well as serious efforts to restore the purity of Nordic blood, including exterminating the sick and impure. In her biography of Darré, Anna Bramwell interprets his writing as an early example of "Green" or Conservationist thinking: he advocated more natural methods of land management, placing emphasis on the conservation of forests, and demanded more open-space and air in the raising of farm animals. Other scholars, however, have challenged this view. One sees Bramwell's books as "devoid of credible evidence" and containing "gross errors". Another acknowledges Bramwell's biography as "undoubtedly the best single source on Darré in either German or English" while at the same time saying that she "consistently downplays the virulently fascist elements in his thinking, portraying him instead as a misguided agrarian radical." Those who heard and heeded Darré's arguments included Heinrich Himmler, himself one of the Artamans. Darré's work also glorified "peasant virtues" – as found in the remnants of the Nordics who lived in the country – and disparaged city living. In July 1930, after Paul Schultze-Naumburg had introduced him to Adolf Hitler, Darré joined the Nazi Party and the SS. Darré's NSDAP number was 248,256 and his SS number was 6,882. Darré went on to become an active Nazi Reichsleiter and to set up an agrarian political apparatus to recruit farmers into the party. Darré saw three main roles for this apparatus: to exploit unrest in the countryside as a weapon against the urban government; to win over the peasants as staunch Nazi supporters; to gain a constituency of people who could be used as settlers to displace the Slavs in future conquests in the East. The German historian Klaus Hildebrand described Darré together with Himmler and Alfred Rosenberg as one of the leaders of the "agrarian" fraction within the NSDAP who championed anti-industrial and anti-urban "blood and soil" ideology, expansion into Eastern Europe to win Lebensraum, an alliance with Great Britain to defeat the Soviet Union, and staunch opposition to restoring the pre-1914 German colonial empire. The "agrarian" fraction took the view that Wilhelmine imperialism had taken Germany in the wrong direction by colonizing lands that were unsuitable for mass colonization by German settlers and had unwisely antagonized Britain. The lesson that the Nazi "agrarians" drew from the Second Reich was that Germany must restrict its ambitions to the continent of Europe in order to win an alliance with Britain and land suitable for German colonization. On 1 January 1932, Reichsführer-SS Himmler appointed him chief of the newly established SS Race and Settlement Main Office (Rasse- und Siedlungshauptamt or RuSHA), a racist and antisemitic organization. Darré was given the rank of SS-Gruppenführer. The RuSHA was a department which implemented racial policies and was concerned with the racial integrity of the members of the SS. 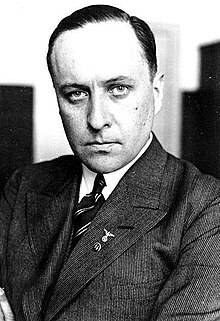 During the 1932 presidential election, Darré engaged in a campaign of anti-Semitic harassment against Theodor Duesterberg, the candidate of the conservative German National People's Party, who it emerged during the campaign was the grandson of a Jewish convert to Lutheranism. Duesterberg was so wounded by Darré's attacks that he challenged him to a duel, a challenge that Darré declined under the grounds that it was beneath him to fight a man with "Jewish blood". Duesterberg then took up his dispute with Darré before the court of honor of the Former Officers of the 1st Hanoverian Field Artillery Regiment of Scharnhorst, number 10 to which Darré belonged. The court of honor ruled in Darré's favor. In his religious views, Dárre would belong to the Pagan faction within the Nazi movement (see: Religious aspects of Nazism); however, unlike Heinrich Himmler and Alfred Rosenberg, he has not become a figure of interest in the speculation about Nazi occultism. Darré's works were primarily concerned with the ancient and present Nordic peasantry (the ideology of Blood and soil): within this context, he made an explicit attack against Christianity. In his two main works (Das Bauerntum als Lebensquell der Nordischen Rasse, Munich, 1927 and Neuadel aus Blut und Boden, Munich, 1930), Darré accused Christianity, with its "teaching of the equality of men before God," of having "deprived the Teutonic nobility of its moral foundations", the "innate sense of superiority over the nomadic tribes". Soon after the Nazis came to power in 1933, Darré was initially excluded from the Cabinet. However, in June 1933, shortly after the Nazis seized full power, he became Reich Minister of Food and Agriculture, succeeding DNVP leader Alfred Hugenberg, who had resigned. He was also named Reichsbauernführer (usually translated as Reich Peasant Leader, though the word Bauer also denotes Farmer). Darré was one of the few Nazi ministers who knew his field well. He was instrumental in founding the Nazi Reichsnährstand corporation as part of the Gleichschaltung process. Darré campaigned for big landowners to part with some of their land to create new farms, and promoted the controversial Reichserbhofgesetz. He also converted most of the country's small farms into hereditary estates that were to be passed from father to son under the ancient laws of entailment. While this protected small farmers from foreclosure and many other modern financial problems, it also tied them and their descendants to the soil to the end of time. He developed a plan for "Rasse und Raum" ("race and space", or territory) which provided the ideological background for the Nazi expansive policy on behalf of the "Drang nach Osten" ("Drive to the east") and of the "Lebensraum" ("Living space") theory expounded in Mein Kampf. Darré strongly influenced Himmler in his goal to create a German racial aristocracy based on selective breeding. The Nazi policies of eugenics would lead to the annihilation of millions of non-Germans. In the course of the preparations for the Generalplan Ost, Himmler would later break with Darré, whom he saw as too theoretical. Darré was generally on bad terms with Economy Minister Hjalmar Schacht, particularly as Germany suffered poor harvests in the mid 1930s. By September 1938, Himmler was already demanding that Darré step down as leader of the RuSHA in favour of Günther Pancke. Darré finally had to resign as Reich Minister in 1942, ostensibly on health grounds, and was succeeded by his state secretary Herbert Backe. The transcript of a 1940 speech supposedly given by Darré was published in Life magazine, 9 December 1940: "by blitzkrieg ... before autumn ... we shall be the absolute masters of two continents... a new aristocracy of German masters will be created [with] slaves assigned to it, these slaves to be their property and to consist of landless, non-German nationals.... we actually have in mind a modern form of medieval slavery which we must and will introduce because we urgently need it in order to fulfill our great tasks. These slaves will by no means be denied the blessings of illiteracy; higher education will, in future, be reserved only for the German population of Europe...."
In 1945, the American authorities arrested Darré at Flak-Kaserne Ludwigsburg and tried him at the subsequent Nuremberg Trials as one of 21 defendants in the Ministries Trial, also known as the Wilhelmstrasse Trial (1947–1949). Count I: participation in the planning, preparation, initiation, and waging of wars of aggression and invasion of other countries. Found not guilty. Count II: conspiracy to commit crimes against peace and crimes against humanity: The count was dismissed, the tribunal finding that no evidence was offered. Count IV: crimes against humanity, relating to offenses committed against German nationals from 1933 to 1939. The count was dismissed upon the arguments of defense counsel. Count V: atrocities and offenses committed against civilian populations between 1938 and 1945. Found guilty. Count VI: plunder and spoliation. Found guilty. Count VII: slave labor. Found not guilty. Count VIII: membership of criminal organizations. Found guilty. Darré was sentenced to seven years at Landsberg Prison. He was released in 1950 and spent his final years in Bad Harzburg. He died in a Munich hospital, on 5 September 1953, of liver cancer. Darré is buried in Goslar. His two main writings were Das Bauerntum als Lebensquell der nordischen Rasse (1928) and Neuadel aus Blut und Boden (1930), translated into English as "The Peasantry as Life Source of the Nordic Race" and "A New Nobility of Blood and Soil" respectively. ^ Bramwell gives the middle name as "Oskar". ^ An unpublished genealogy, consistent with census information available online, gives Eleonore's parents as Theodor Erik Lagergren, born 1839 in Glömminge, Sweden, and Josefina Margarete Thole, born 1841 in Haselünne, Lower Saxony, Germany. ^ Letter to his wife Alma as quoted by Bramwell. ^ Full name Alberta Helene Theresa Alma Staadt; date of marriage 29 April 1922: see catalog of archive materials held by the Munich Archives relating to Alma Darré available at http://www.ifz-muenchen.de/archiv/ed_0916.pdf (consulted 18 Jan 2014). ^ Peter Staudenmaier. "Fascist Ecology: The "Green Wing" of the Nazi Party and its Historical Antecedents". A.K. Press. ^ a b c d Wette, Wolfram The Wehrmacht, Cambridge: Harvard University Press, 2006 page 65. ^ Hakl, H. T. Nationalsozialismus und Okkultismus. (in German) In: Nicholas Goodrick-Clarke: Die okkulten Wurzeln des Nationalsozialismus. Graz, Austria: Stocker (German edition of The Occult Roots of Nazism, 1997, p. 197). An English translation of this essay is available. ^ Lovin, Clifford R. (October 1969). "Agricultural Reorganization in the Third Reich: The Reich Food Corporation (Reichsnahrstand), 1933–1936". Agricultural History. 43:4: 447–461. ^ "Secret Nazi Speech: Reich Minister Darré discusses the world's future under German rule", Richard-Walther Darré, Life, 9 December 1940 (Ginger Rogers cover), pp. 43–44. 'Life' suggested a lack of confidence in the veracity of their report with the comment "Even if [this address] was not delivered exactly as recorded here, it might have been"
Bramwell, British Library Integrated Catalogue, and Bramwell, Library of Congress Online Catalog. Wikimedia Commons has media related to Richard Walther Darré.